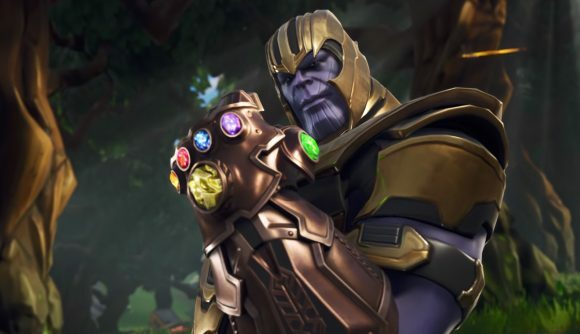 Fortnite has been absent both Thanos and the Infinity Gauntlet for some time, but based on the latest datamines it seems they’ll both make a comeback sooner rather than later. The battle royale’s wildest LTM yet came to a close earlier this year as hype around Avengers: Infinity War wound down, but it looks like it’s not gone for good. The 6.20 update brought a host of back-end changes to Fortnite, and as always dataminers have dug through the files for preview of what’s coming next. One of the more curious changes was an update to Thanos’s laser ability. That laser hasn’t been in play since the Avengers crossover ended, so naturally we’re left to wonder if this means the LTM is coming back. Those files come courtesy of FortTory on Twitter, and the timing makes some amount of sense. A trailer for Avengers 4 is confirmed to be coming this year, and the film itself is little over half a year away – any time between now and then would be perfect for the mode to make its return. Of course, it’s not as if the Marvel Cinematic Universe is ever out of the current spotlight, so any launch date could work. The Fortnite-meets-Infinity War mashup was one of the most visible indicators of the ridiculous success of Epic’s battle royale, and it resulted in a pretty delightful game mode, too. Even if the Thanos dance proved pretty upsetting to Josh Brolin. Fortnite continues moving ahead with or without Thanos – so check out our guide to Fortnitemares challenges and find out how to unlock the game’s Halloween goodies. Thanos may come and go, but that sick new glider is forever.